Found 44 file extension associations related to Microsoft Word for Mac and 32 file formats developed specifically for use with Microsoft Word for Mac. Word for Mac helps you structure your ideas, market your business, and create everything from a murder mystery to a holiday newsletter, with style. Then save, edit, and share online. Create visually rich newsletters, brochures, and documents easily. A powerful user interface gives users the ability to easily manipulate the layering of text, shapes, pictures, SmartArt, and charts in a document. Word also features new ligatures for more professional-looking documents, and new typography features for more creative document options. Instantly see the Styles applied in your document, enabling great-looking documents with consistent, recurring formatting. And with the introduction of Styles Visual Aids in Word, there are now color-coded visual aids that reinforce the relationship between Styles and in?document content, while also providing one?click checking for potential formatting errors. Styles are easier to use and more reliable than ever. Maximize the space for reading and writing documents. The Full Screen View feature enables a Word user to block out all other windows, menus, palettes, and other superfluous content on the screen, to be able to completely focus on the task at hand: either reading or editing a Word document. Reorder Objects enables you to easily rearrange layers of text, photos, and graphics throughout your documents. This new functionality allows users to intuitively and directly manipulate the layers to achieve more predictable results, without cumbersome clicking and dragging. Post, access, edit, and share your files from virtually anywhere. 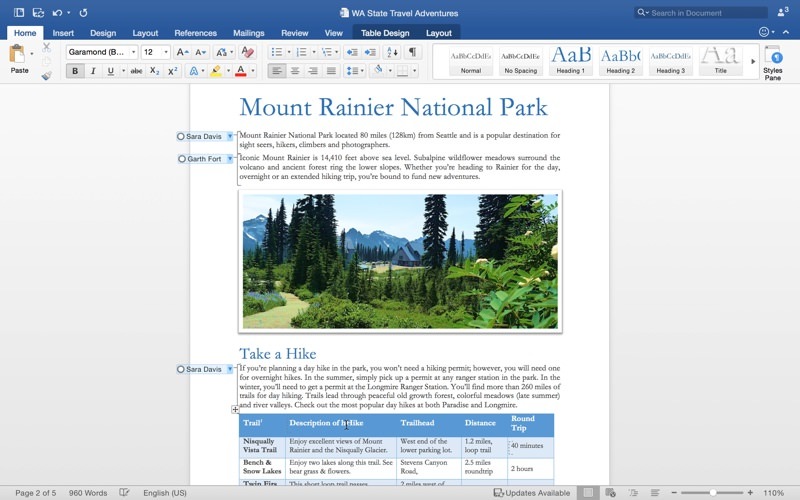 Word is now integrated with Windows Live SkyDrive, so that your documents can be stored, viewed, edited, and shared in the cloud from any computer with Internet access. Supported browsers include Internet Explorer on Windows, Safari on Mac or Windows, and Firefox on Mac or Windows. Word for Mac enables several collaborators to simultaneously edit the same document from different computers in different locations. During a coauthoring session, users can see when updates occur, be informed of presence of the other collaborators, block other authors from making changes to sections they are working on, and work around conflicting changes. If you need more information please contact the developers of Microsoft Word for Mac (Microsoft Corporation), or check out their product website.